Makoto Tsukimoto (nicknamed Smile) is a quiet high-schooler who's been friends with the loud and energetic Yukata Hoshino (nicknamed Peco) since childhood. 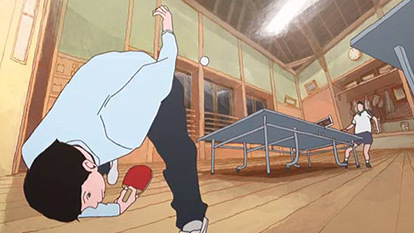 They're both in the local table tennis club and both have a natural talent for it, although Smile's personality always prevents him from winning against Peco. The club teacher, however, notices Smile's talent and tries to make him gain some sportive tenacity.